Yep, that’s right. Never take sales for granted — when it comes to sales keep on truckin’. Never stop marketing. Take good care of your customers, but make marketing your top priority — every day — to prevent a roller coaster ride of profit and loss. This means keeping your sales pipeline full. Not to sound mystical, but it’s really true. The ideal time to market your business is when you’re in demand. Customers are more enthusiastic about your products and services if they’re all the rage and you’re confident about sales. There’s an old adage that’s apropos — it’s called the “bandwagon effect.” Customers are more likely to hop aboard your sales train if you’re not needy and desperate. But are you swamped? Are you even turning away business? Maybe you’re thinking, “I’m too busy.” Well, you can’t afford to be too busy for marketing. If you get complacent about sales, you won’t be around long term. Nothing is forever in business. Relationships change and even end — no matter how good you are. The marketplace is dynamic. There’s a myriad of reasons why you will lose business if you don’t focus on marketing. Competitors get better. Customers develop cash flow issues. New competitive products and services steal the limelight. Don’t take shortcuts. Keep marketing, networking and selling. Always maintain your top-of-the-mind awareness. Former and long-time customers should not be ignored. They are your best source of referrals. Use every tool at your disposal: E-mail, newsletters, social media, telephone calls, speaking opportunities and the best tool ever — in-person contact. Identify and develop a prospect list. Focus on proper time management to schedule projects. Don’t lose a potential customer because you’re too busy. People don’t like to be taken for granted. If you lose a prospect, remember it’s forever. Plan ahead. Have a plan in case you do get more business. Line up consultants, independent contractors, and/or part-time workers. If you are successful and it looks favorable long-term, consider hiring more help. Review your pricing. Remember the law of supply and demand. Consider whether you’re charging the right amounts. Maximize revenue. It’s harder to raise prices than it is to lower them. Focus on prospects who are likely to need your products and services on an ongoing basis. Develop a foundation — a prospect list of anchor customers or clients. They will guarantee that your basic expenses and needs will continue to be met in order to operate at full capacity. But keep monitoring your relationship with them. Otherwise, you’ll never know when your pipeline will slow down. 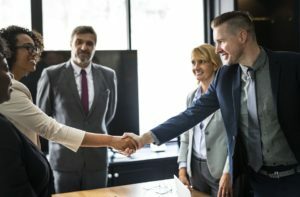 5 Critical Fundamentals to Build the Best Sales Staff — The crucial question: How can a company develop a top sales crew? Short answer: Start with a premise — if it were so easy then everybody would be doing it. Long answer: Some companies are achieving stellar sales results in complex global situations by adopting best practices.